On May 20, my fam and I were able to see the annular eclipse from our front yard. I took many pictures, but will only subject you to a few of them. Hope you enjoy! I know we did. Today we were eating a special lunch to celebrate my daughter’s kindergarten promotion and a young lady approached me. Young lady: Hey! Aren’t you Mrs. F.? Young Lady: You are my sister’s favorite teacher. She talks about you all the time. The catch? I taught her in 6th grade. She will be a senior next year. Who says teachers don’t make an impact? Crazy people, that’s who. As summer approaches, there is a feeling of anticipation and frustration. Students and teachers are counting the days until the sweet, sweet release of the last day of school. We are occupying the same space, but there is a tenuous truce, an air of tolerance, safe in the knowledge that we only have a few days left until the end of school. Everyone is sick of each other. This sick is not a simple cold; it is a festering buboe of yuck that is about to pop. Kids are tired of the “blah, blah” they hear when we talk. We are tired of seeing their lovely faces. Even the good kids start to grind on the last nerve. It is nothing personal. The beginning of the next year will bring a return of the fond feelings that arrive with the hope that a new year brings. Right now, however, there is a gritting of teeth as we all keep up the facade that we are not tired of each other. As we wrap up the year, there are some mannerisms of theirs that are making me nuts. The fact that they lose focus every three minutes (okay, that might be an exaggeration but some days it feels that way) makes me hang my head in frustration. When they start cleaning up five minutes before the bell rings –even when I am closing up the lesson and still talking — it screams disrespect. Unfortunately, at this time of year, it is something that increases in frequency. I know this but it still irritates me. They are also tired of my mannerisms. Okay, maybe this is not true. I asked my kids what irritated them the most about me and they gave me nothing. Seriously! The only thing that they could give me was that sometimes I’m too nice and they are worried that I will be taken advantage of. Silly kids. I told them that I could try to be meaner, but they didn’t think that was a good idea. I tried new things this year. Some were successful– integrating even more technology in my classroom. 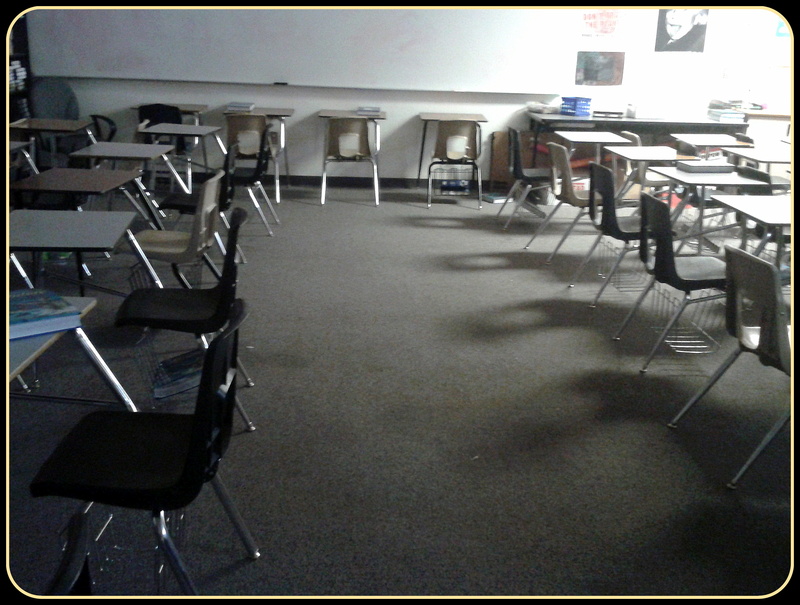 Other things bombed like the movie Battleship (my attempt to get a classroom blog going). The one thing that seemed to affect my students the most was when I arranged my classroom to a completely non-teacher centered classroom. How do you make kids squirm? My kiddos got positively twitchy. I didn’t realize that switching it around like this would freak them out so much. I have to admit that I took twisted pleasure out of their discomfort. The amazing thing, though, is that most grew to like it. It gave them a feeling of freedom that they didn’t have when they were stuck facing the board. I also noticed something else. They stopped asking me questions and started working more on their own. My goal has always been to make myself unnecessary in my classroom. Achievement unlocked! I am quite fond of my students. I will be even fonder of them when they are no longer with me every day. After a long absence from the blogosphere, I am returning. I hope. My classes for this semester are done and summer is approaching. I have missed writing very much. There are many half completed posts that I plan on working on and posting. My blog will seem tangential, but at least I will be writing.